Website is showing error establishing database connection in the browser. This means that for some reason your php source code is not able to connect your mysql database, to retrieve the informations which needs to be be placed on your host web page. 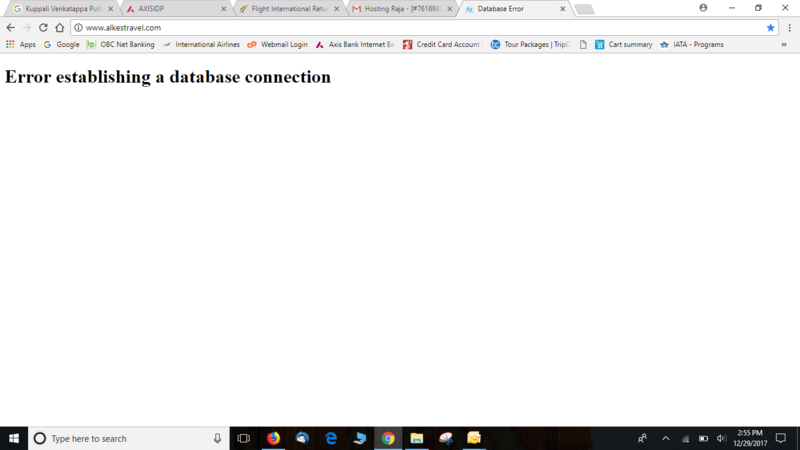 When the web host fails to connect to the database it will be left with lots of prime functionalities while connecting to your server and the database, that causes this error. repairing the website could resolve this website.If you are having the dynamic web pages rather than static web pages on HostingRaja VPS or Cloud server then you need to proceed next steps which we have mentioned below. Cloud computing has become one of the mostly used phenomenon in today’s world. As it must be known that each type of technology has its own limitations so does the cloud have. Most number of issues starts when the user loses control over the data. This problem or issues may be due to any one of the following problem with HostingRaja VPS or cloud. With the cloud losses of resources are rare as the infrastructure is designed to feed the immediate resource when one of them collapses. So it can be a reliable decision of opting the cloud server. Incorrect Database Credentials: If database is created with appropriate username and password under HR Panel Mysql Module Then you need to check whether same login credentials are given under your database configuration file which you have placed under public_html. If no database is created and you are placed incorrect database connection details on your configuration file will results in connectivity error. a) It might be beause of Improper shutdown of MySQL server due to power outage. b) If have used “killall -9 mysqld” command to shut down the server and killing all ongoing mysql processes. c) MySQL Services might have got stopped due to high load in the server or RAM usage exceeded its limit. d) If you are having a large amount of data’s in your database. So in that case you should make sure that there is enough disk space to store the data in advance. 1. You need to check whether you have written proper database connection credentials under database configuration file. If you found no data or improper database name,username and password then you need to check the proper details from HR Panel mysql database modules and update it on your source code. If database cannot get repaired you need to upload the previous backup of databases. Next Step you need to optimize your mysql for faster response so that you can reduce too many connections and reduce RAM usage. You need to add these lines on your my.cnf file.